Woah! October is here…but there is still time to create some fun and inexpensive Halloween décor! So to help you out, I have gathered all of my super-easy Halloween projects in one place so you can get started! Here’s a favorite of mine…my Halloween duct tape pumpkins! All you need is some seasonal duct tape and a few pumpkins from Dollar Tree and you are in business! You will find a complete tutorial here. And while you are at Dollar Tree, pick up a few of these fun crows…perfect for my Wisteria inspired witchy crows! You will find a link to directions for the tiny witch hats on my blog here. These cute Halloween sock pumpkins are made from $1.00 faux pumpkins from Walmart and Halloween socks from the dollar aisle at Target! Just add felt leaves and curly pipe cleaner tendrils and you have a fun little pumpkin for the kiddos! You will find the directions here. Want to add a literary twist to your Halloween décor? 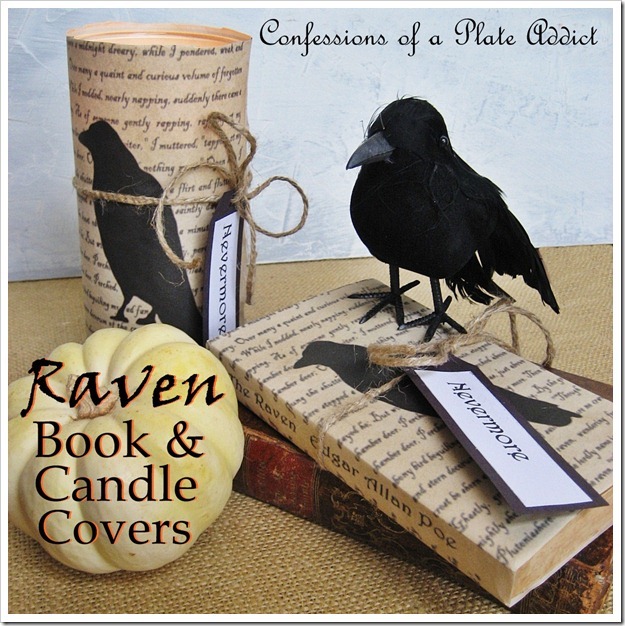 Then I have just the thing for you…my raven book and candle covers…starring Edgar Allan Poe’s The Raven. You will find directions for making them plus the free graphic here. This project combines Dollar Tree candle holders with vintage Halloween postcards to create these super-easy vintage Halloween candles! You will find the free graphics and instructions for making them here. And I can’t talk about Halloween projects without showing you one of my all-time favorites…my Jack-o-lantern pillow with interchangeable faces! It uses inexpensive drop cloth, felt and burlap with a thrift store down insert. There’s even a little pocket on the back to store the face parts that are not being used! This one is sure to be a favorite with the little ones! A complete tutorial, including the graphics needed, can be found here. And on the subject of Halloween, another fun No-Sew Showcase is coming this Saturday, October 12th, so you will want to come back by to see what we have to show you this time! Our two previous showcases have been very popular and we are excited to bring you another one…this time with a Halloween theme! Thanks for stopping by! I hope you enjoyed seeing all of my Halloween projects! Please visit these wonderful bloggers and their beautiful blogs to see what they are up to and to find a list of this week’s participants! Adorable collection! Love the raven candle wrap especially!! I love everything you do. You are the cleverest, Debbie! I love the duck tape pumpkins and the post card candles. But then, I love that pillow and the crows, too! Can't pick a favorite. Trying to type with a broken hand. We'll see how I hold up! Love these ideas.... What great pics! Love all your cute ideas! The pillow is so pretty! Hi Debbie, You are so creative and I love all your projects! Thanks for joining the Open House party and I hope you have a wonderful weekend. Great projects Debbie! Thanks for adding to HSH!